Given the recent news coverage about cyber security risks, more and more website owners are migrating their websites from insecure platforms to new frameworks that can better assure a safe and secure environment for them to administer, manage, and deliver their websites. Most time-sensitive CMS migrations we see are headed by marketers of informational, corporate websites. With the heightened sensitivity to cyber security attacks, internal IT departments are applying extra pressure on their organization’s marketers to migrate away from off-the-shelf platforms that they feel don’t pass the corporate security standards they are tasked to enforce. Oftentimes, there is pressure to go through this process quickly, as every day that a site is vulnerable and exposed, there is a greater and greater risk to the company. So what steps should you take if you have to quickly migrate? 1. Take time to research and evaluate your options. There are multiple secure platforms and frameworks available, and you have to research the pros and cons of each. Are you still looking for something open-source or something licensed by another vendor? Will a CMS platform suffice, or should you look into custom CMS solutions? Also, contemplate the architecture of this new platform. We recommend taking a look at a headless or decoupled CMS. This, in a nutshell, is when the administrative portal is separated from the front-end display of the website. This separation or decoupling results in a deep level of security. By separating the complex machinery of admin tools and function, you are able to take the most vulnerable part of the site and keep it under lock and key, away from the world. This is a secure architecture that IT departments will love. 2. Architect your project properly. When you have chosen a platform to move forward with, spend some time architecting what your project looks like. If you are in a rush to go live, consider simply taking your existing design and integrating it into a new platform. Removing the design-revise-approve process from a web project can increase the overall timeframe dramatically. With this time-consuming process now out of the equation, focus can be spent on simply taking the front-end code and migrating it to the new platform. This phase should be focused on integration. 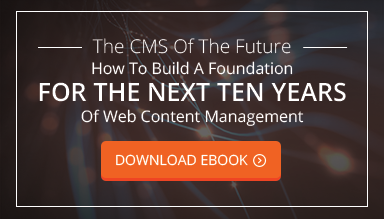 How will the new CMS handle the content management duties you were previously performing? Can you improve workflows? And most of all, have you solved your security problems? The best way to ask and answer these questions properly is to either engage in a discovery process before your project with a qualified CMS vendor or to engage in a similar process in-house. If you architect in-house, make sure you have your eventual vendor work with you to vet the specification and verify that it is technically sound and reasonable. 3. Figure out what your hosting scenario will be. We’ve performed conversion projects where all of the hosting arrangements weren’t completed on time and, as such, the entire project was delayed. Be sure you know what technology your host will need and that you have all proper parties in place to smoothly migrate the site when it comes time to deploy. By the way, this is also a perfect time to migrate your website CMS into a new type of administrative control. Take advantage of the chance to split your site into modular components, which can make administration easier in the future. Utilizing modules, you can add, edit, and modify pages much more easily. What used to take hours can now take minutes. Most modern designed websites can be split into modular components relatively easily and with minimal design changes or UI/UX involvement. 4. Get ready to launch. Content migration. Make sure all old content is migrated from the current website to the new one. This isn’t just web pages, but also old files that were possibly embedded and uploaded in alternative locations. This is a common error during migrations. SEO adjustments. If URLs will change, you should be prepared to redirect the old addresses to new addresses via 301 redirects. This is very important to make sure that you don’t lose SEO ranking value. URL verification. It’s a good idea to visit search engines such as Google and do a “site:yourdomain.com” search. This will show you what pages are currently indexed. You want to ensure that all the URLs work on your new website. There are ways to automate this process of verification, which will make it much easier to test. Quality assurance. Thoroughly test all admin tools and make sure they properly manage content on the front end, and that the tools behave as they should. Training. It’s important that your CMS vendor works with you and your team to train you on the proper use and functionality of the CMS. 5. Triple-check all of the above. You are always better off safe than sorry. If you did work with a vendor, make sure you have some level of support after launch, such as a code warranty or maintenance agreement. Also, make sure that you have all necessary access to hosting environments, code repositories, and any other logins you may need, including licensed plugins or similar. Remember, security is important, so undertaking a migration plan is the prudent thing to do. It can be done quickly—in a matter of weeks instead of months—if you plan properly and progress through the project in a manner similar to the one described above. For more information about our CMS migration services, please contact us.